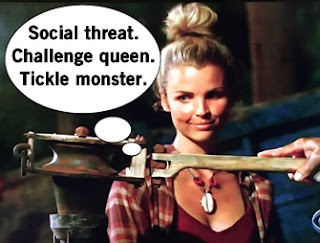 There's some rumblings that Sarah might've pandered to Sierra at the last Tribal Council and they're darn right: Sierra willed Sarah the Legacy Advantage. After Aubry totally kills and sets the new Survivor record for the domino/card stacking Immunity Challenge, the majority decides this would be a wise time to vote off Brad (but first, Michaela requests Brad go fishing). There's some consideration about voting off Sarah, but ultimately think this isn't the right time for her to go. 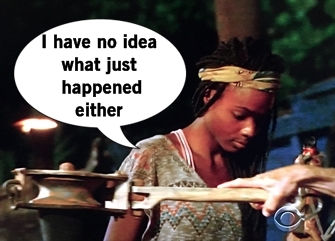 And that's because the time is turning on Andrea, whose tight ally Cirie approaches Sarah to blindside her. Tribal Council time! Aubry says after the last vote there's a more solid "we" than before and Sarah agrees with the ol' "if it's not broken, don't fix it." There's discussion about a lack of scrambling on the beach which is both good and bad, according to Andrea. Conversation turns to the jury and while there's hope the jury will reward good gameplay on day 39, there's also real emotions in play and betrayal stings. The tribe votes and blindsides Andrea, whose alliance sends the social and challenge threat to the jury. But not before she gives Cirie a tickle on the way out (not kidding). Aubry is crushed to yet again lose her tightest ally and her Kaoh Rong friend Tai comforts her. Later, Aubry and Tai have a discussion and agree Sarah is running things and would be that big "resume making" move. 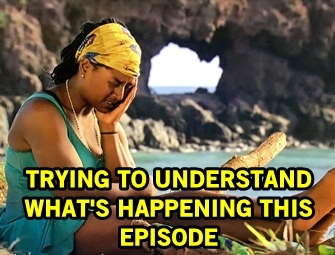 Aubry relays this conversation to Cirie, who in turn tells Sarah. Sarah believes Aubry is lying and trusts Tai more, then offers Cirie her advantage as an extension of trust and faith in Tai. Cirie begins hatching a bigger plan to use the advantage to save Sarah, by taking away Sarah's votes and then saving her with the votes. Cirie's afraid Tai will play an idol, so she lets him in on the plan and says she's going to use the advantage to save him. This is all very confusing. Tribal Council time! With Brad having immunity, Probst wonders what they dynamic at camp was like trying to decide who to vote out. Sarah says this time there was a lot more scheming and lying and this Tribal Council will show her the truth. Lots of talk of trust and moves, and then when it's time to vote Cirie decides to make her big move and play the advantage to steal Sarah's vote and expose "the rat." Sarah interjects! Turns out the vote steal advantage is non-transferable and Cirie didn't see the fine print until it was too late. And so begins Tribal Council chaos. Sarah gets up and whispers to Tai, then Cirie whispers to Sarah and Michaela jumps in. Soon everyone is up and whispering again like a super messy game of Telephone. Sarah opts to use her advantage and steals Tai's vote. Cirie votes for Aubry, Aubry/Michaela vote for Tai, and Sarah uses her two votes to join forces with Brad and Troyzan and votes Michaela out of the game. A big night of blindsides condensed into one hour.